Party denies overtures made to Hitorerut Chairman and former Jerusalem mayoral candidate to join ministers Bennett and Shaked in new party. 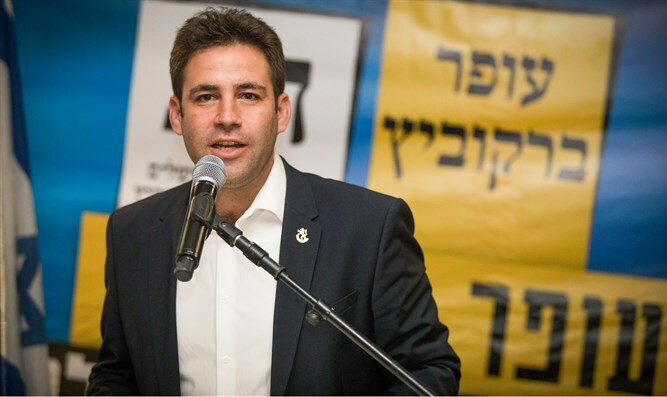 Hayamin Hehadash (The New Right) party headed by Ministers Naftali Bennett and Ayelet Shaked denied this morning that a proposal was offered to Hitorerut Chairman Ofer Berkovich, who was a Jerusalem mayoral candidate in the last election. "Fake news. It never was but thanks for the interest," the party wrote in response to the report in Israel Hayom newspaper. Berkovich said in conversation with the paper that "there are feelers from their direction," but cautiously said, "I'm committed to serve the residents of Jerusalem and I'm in the municipality." It is possible a query may have been made to Berkovich to probe his intentions and the possibility of his joining, but with no formal and significant development. Last night it was also reported the party had examined MK Merav Ben-Ari of Kulanu who refused, and two other names that were raised in this context were Maj. Gen. Doron Almog and Israel Prize laureate Miriam Peretz, who said they had no intention of joining politics.